Wowsers it's Christmas Eve and the elves are still at work! Are you still doing last minute preparations, or are you just going to ride it out for the rest of the season? I still don't know what we're going to do for Christmas Day - we plan on making a nice feast for Christmas Eve but I think we decided to go out to dinner for Christmas Day. The question is, where? What's your Christmas tradition? 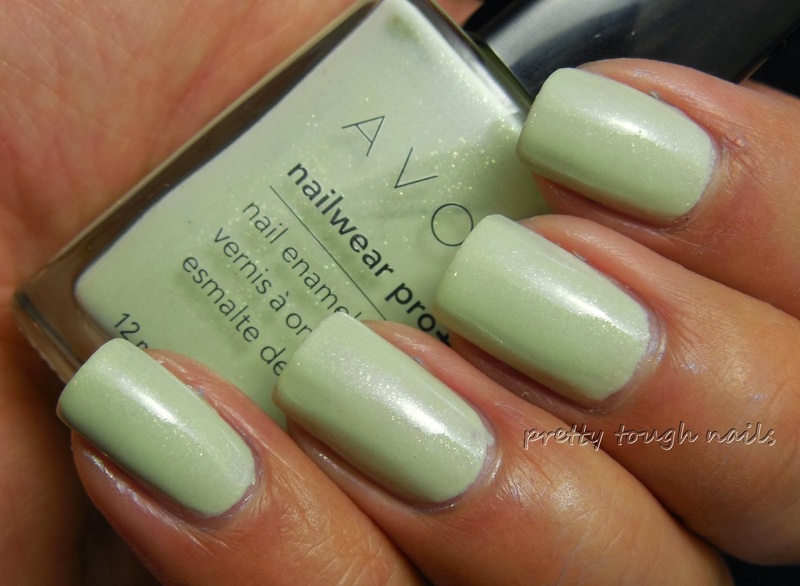 I have a lovely mint green that I've been wanted to swatch for you today, and it's by Avon called Honeydew Sparkle. This was part of the Forbidden Fruits collection, all of which were juicy bright colors with tons of glass flecks embedded within. This is a light mint green shade with the aforementioned glass flecks, and the formula unfortunately was a bit disappointing. It did not want to go on evenly during application and so I used three coats to hide the streaks in this mani. This was the type of application to make the most seasoned nail polisher feel like a clumsy oaf. No topcoat in these pics, because at least it redeemed itself with a bit of its own inherent shine. Well, true to its name, it really does look like a glistening piece of honeydew. I wish the glass flecks were easier to see, but I guess that's due to the nature of the lighter color base. Next, to quench that thirst for sparkle, I used a Lynnderella that's been gathering dust in my polish drawers, She Livedina Swamp. 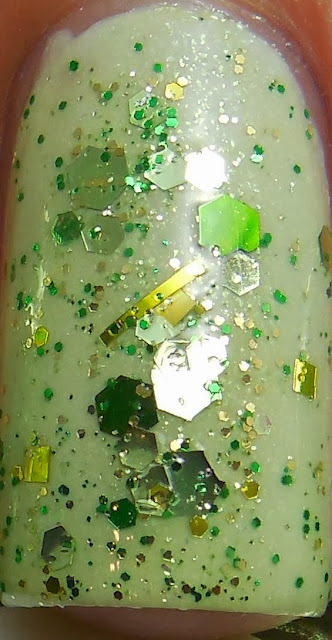 This has varying shades of gold thru green multisized and shaped glitters with microsparkle in a clear base. I used two surprisingly easy to apply light coats(think super dusty, with evaporation and minimal shaking despite glitter sinkage) followed with a generous coat of NYC GCS. I think this turned out to be a Christmas Eve appropriate mani with the festive green glitters, and I love how the gold ties it all together and gives it a holiday feel. And as a heads up, I might not be posting as regularly as I like as I've been banned from my polish workspace for the rest of the week by the deluge of family members that are here to visit for the holidays. I hope that you're having a wonderful holiday and celebrating it with your loved ones in your own special way. Merry Christmas! Despite the troubles with application, this color and combo look beautiful on you! Merry Christmas to you and your family! Merry Christmas to you dear!! I'm loving your slew of indie posts! love this color ! perfect ! Honeydew Sparkle is so pretty! I love it. Perfect combo too! That Lynnderella looks awesome on top. Thank you! I'm trying to practice my glitter topcoat color coordination. I still have a ways to go!